So……I like to make quick breads. Obviously. I’m shoving them in your face on a fairly regular basis. But I changed it up today, it’s little mini loaves instead of muffins. I’m creative like that. 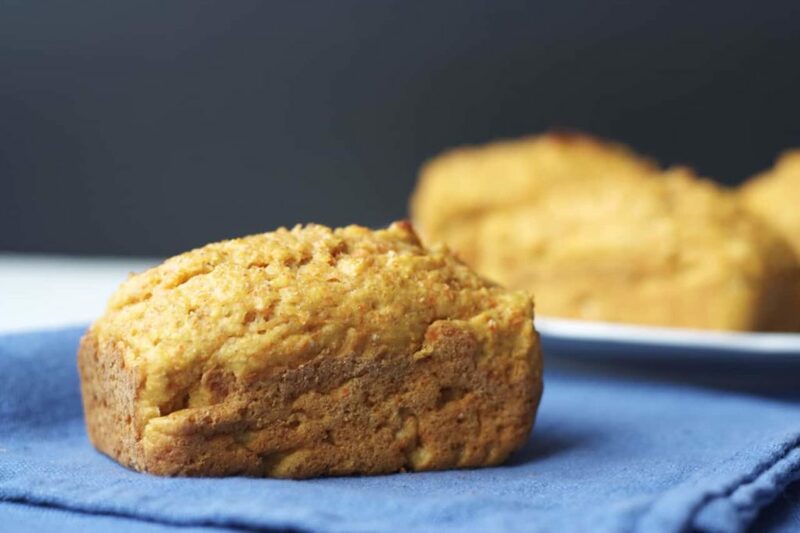 And these carrot and pear mini loaves are super healthy too! Wonderfully moist, tasty as can be, and filled with good for you stuff! Whole wheat flour, lots of pears and carrots, hardly any sugar (just 1/3 cup of brown sugar!) and no oil or butter at all. These mini loaves get all their moisture from the carrots and pears, and from some plain Greek yogurt. I suppose there’s a bit of fat in the Greek yogurt, but not enough to concern me at all. In my opinion these are about as healthy as it gets for a morning muffin. Or a mini loaf. You know, since that’s what I made. But you could easily use a regular muffin pan instead, I just felt like changing things up a bit, so I made mini loaves instead of the usual muffins. Cause that’s totally different. Besides, they’re just plain cute, don’t you think?! These carrot and pear mini loaves were actually the result of buying way too many pears and needing something to do with them. My son loves pears, but the rest of us aren’t huge fans. We’ll all eat a pear now and then when it’s perfectly ripe, but to be honest, I’ll usually reach for an apple, and my daughter is the same way. And the other two just plain don’t eat fruit much. Cause they’re crazy. So when my son asked for pears, I grabbed some, but for some unknown reason decided to grab the big bag instead of just a couple. Because it’s cheaper that way…..unless they go bad in your fridge since only one person is eating them. Maybe that was a bad plan? But then, maybe not, because I hate wasting food, so needing to use up pears resulted in these cute little loaves. And we all loved them. So it was completely the right choice to buy the big bag after all. Especially since these took a few tries to get perfect – good thing I had lots of pears to use up! Don’t worry, we still ate the rejects. After all, I didn’t want to waste food! But this combination made the best carrot and pear mini loaves. So next time you have some pears that are ripening too fast, try these little loaves out, I’m sure you’ll love them! Preheat the oven to 400 degrees F. Lightly spray a mini loaf pan with non-stick cooking spray and set aside. In a large bowl, whisk together the whole wheat flour, all purpose flour, baking powder, salt, cinnamon, ginger and nutmeg. Set aside. In the bowl of a food processor, combine the pears, carrots, brown sugar, yogurt and egg. Process until well combined. Alternatively, you can finely grate the pears and carrots and mix together with the rest of the wet ingredients in a bowl. Add the wet ingredients to the dry and stir until just combined. Don’t overmix. Divide the batter into the prepared mini loaf pan. Bake for 25-28 minutes or until a toothpick inserted in the center comes out clean. If you’re making muffins instead, it will likely take a little less time. Store in an airtight container at room temperature for up to 3 days, or freeze for up to 3 months. I am so happy that I found this recipe, thank you Stacey! I will definitely make them in a few days because I have a bunch of pears that I bought from the grocery store! 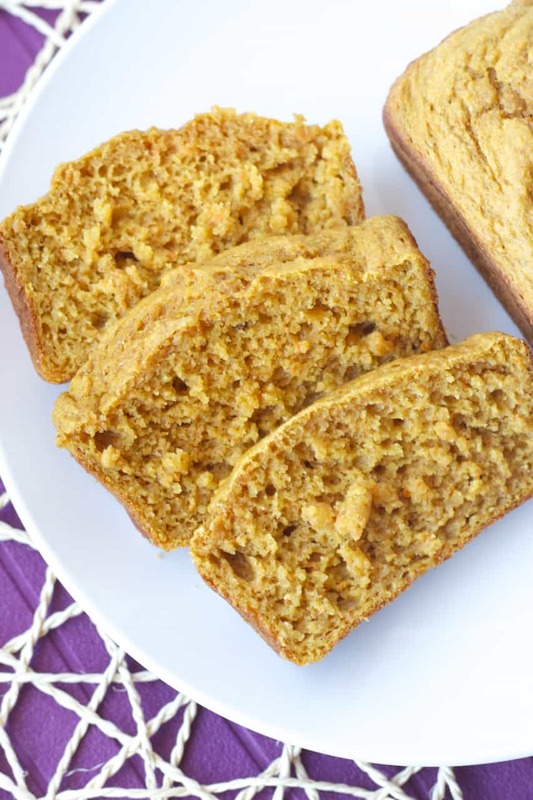 I love quick breads too and anything mini is always more fun to eat :) I've never thought to pair carrots and pears together but totally love the sound of that combo! I'm the biggest fan of carrots. Love them a lot! Omomomomomomom!! This recipe is amazing so I'll make it soon! Yummy, yummy! Thanks Agness! Hope you like them! I love that you used pears in these adorable little mini loaves! I feel like they are such an underused fruit (I always forget about them!). I totally always forget about them, but wish I used them more often, they are definitely underused! Thanks Ashley! I was thinking cream cheese would be great with them, but I never had any to try it out! Let me know if you try that! Thanks! These sound so perfect for breakfast! I also tend to choose other fruits over pears (even though I like them) so this sounds like a great way to use them up. And I NEED to get these adorable mini loaf pans! I love mini loaves, have been thinking to get a mini loaf pan...These look so cute! :) what a great idea to use all that pear and carrot! Thanks April! Mini loaves are just a nice change from regular muffins. They're so cute! 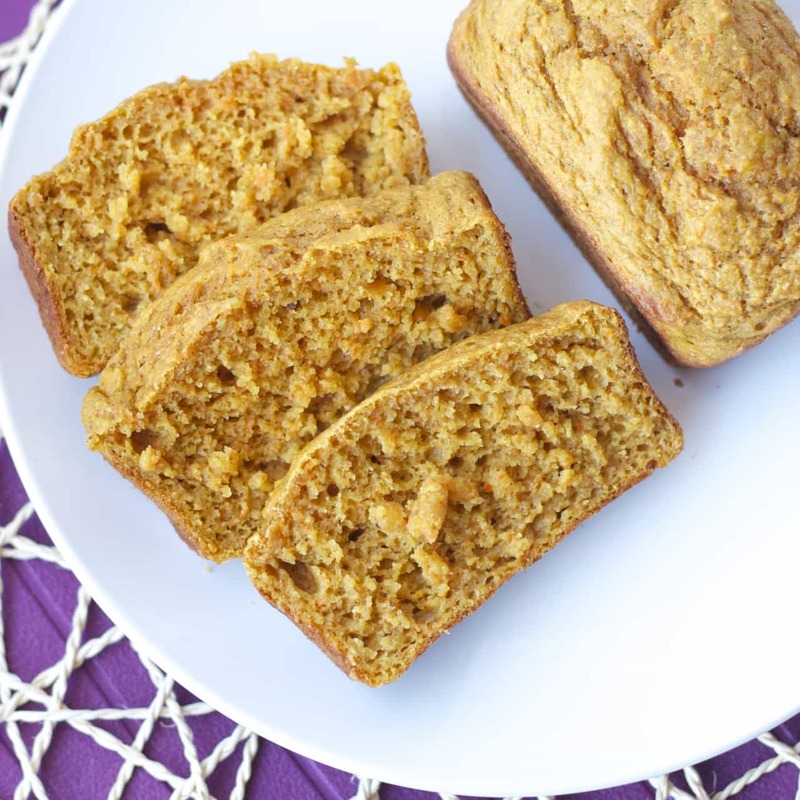 You should totally get one if you make a lot of quick breads! It was completely the right choice to buy the big bag! This sounds so good and the mini loaves are so cute! And I just happen to have mini loaf pans!! I'm so excited! Thanks Annie! Mini loaves ARE so cute aren't they?! I need to make them more often! I just love this flavour combination! Yum! I actually have a mini loaf pan too!!! I dont know why I don't use it more often!!! 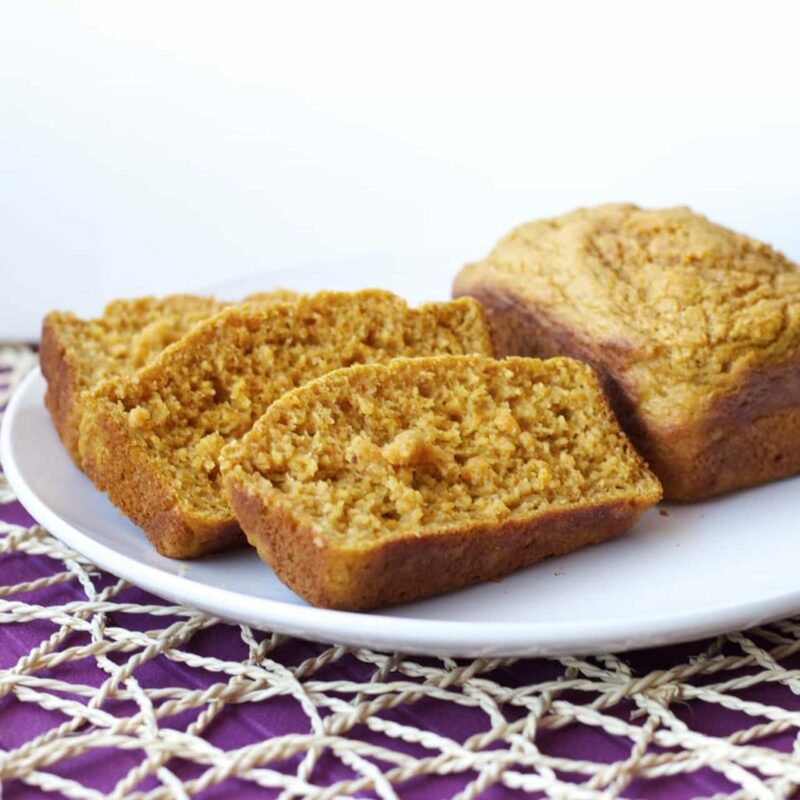 love these carrot pear mini loaves and what's great about the mini's is that you can give some away too! I know, that's what I always think when I do use it! I rarely do, but I really like that mini loaf shape when I actually think to use it! Stacey I love quick breads so I can't complain! I love your combo of carrot and pear. What a great idea! Carbs -- check. Mini -- check. Healthy -- check. Delicious -- check. All of my favorite things! Lol. What an interesting combination. I get stuck with the same old kind of quick breads every time. This looks like a good way for me to mix up things a bit and really surprise my family! Thanks Kathy! Hope you like them! You had me at quick bread. I know I can make it! Haha! I love quick breads too. So easy to whip up, and so versatile. I love the idea of combining carrots and pears! That sounds really delicious together! Thanks Sarah! That's exactly why I love quick breads - so quick and easy, and so many combinations! I love making mini loaves! There fun to whip up and mini foods always seem to taste better. This flavor combination sounds fantastic, Stacey! I would've never thought to combine carrots and pears, sounds like they were meant to be together! Ooh, that does sound good. I kept thinking cream cheese, but they were gone before I actually went and got some to try it! Thanks Dennii!